We are excited to receive news from the Cape Leopard Trust researchers residing on La Motte that they have identified their first leopard on the farm. Spotted a mere 500m from the house on the farm where researchers Anita and Jeannie are currently living and conducting their research from, the healthy adult male sauntered past the camera, allowing for some beautiful images to be captured. 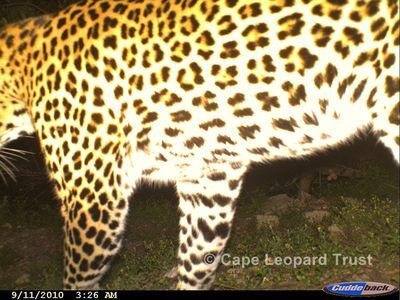 The Cape Leopard Trust cameras set up on the farm is ideal for identifying mammals in the region, and allows the leopards to be tallied and their movements followed. This particular leopard was identified as BM4, a male normally residing in the Wemmershoek area. Below is a photo taken by the camera.